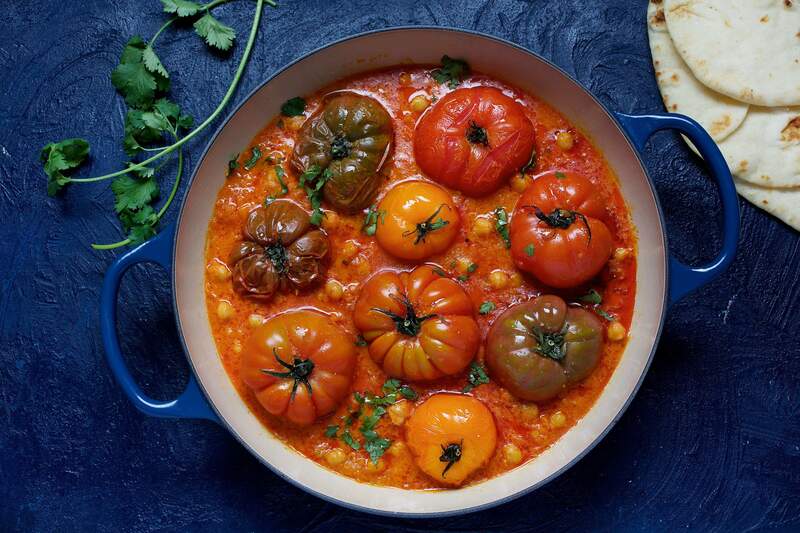 Roasted Tomato and Chickpea Curry. That’s where shortcuts come in. Take a recipe I’ve been saving for tomato season, from New Feast by Greg and Lucy Malouf (Hardie Grant, 2017). Their Roasted Tomato and Chickpea Curry calls for a long list of spices and aromatics, but my mind went to store-bought curry paste – a quick, flavor-packed base for Thai-style curries. Would the substitution work? I thought so, because the dish also includes ginger, garlic, cilantro and coconut milk. So 10 ingredients came out, one went in, and the dish’s flavors morphed pretty seamlessly from Indian to Thai. My adaptation didn’t disturb the most obviously appealing thing about the recipe, which is that you briefly roast a couple pounds of whole tomatoes, cut one of them up to go into the curry, and nestle the remaining ones in the pan. It makes for a stunning presentation – especially when you leave the stems on the tomatoes. I brought the dish back to India again when I ate it with naan and yogurt, using the bread to smash the soft tomatoes and scoop them up with the chickpeas. Messy. And interesting. But not intimidating in the least. Serve with rice, naan and yogurt, if desired.Ingredients:2½ pounds medium vine-ripened tomatoes, stems attached if possible (for visual appeal)2 tablespoons extra-virgin olive oil½ teaspoon kosher salt, plus more as needed1 medium onion, grated or finely chopped3 cloves garlic, finely chopped1 tablespoon peeled, grated fresh ginger root2 tablespoons Thai red curry paste, such as Thai Kitchen brand1¼ cups coconut milk (may substitute low-fat coconut milk)2½ cups cooked or canned no-salt-added chickpeas, rinsed and drained (from two 15-ounce cans)½ cup chopped fresh cilantro2 cups cooked brown rice, for serving (optional)2 to 4 pieces naan, for serving (optional)½ cup Greek-style yogurt, for serving (optional)Method:Preheat the oven to 350 degrees. Arrange the tomatoes on a rimmed baking sheet. Drizzle them with 1 tablespoon of the oil and season them with ¼ teaspoon of the salt. Roast just until the skins start to split and the tomatoes start to soften but hold their shape, 10 to 15 minutes. Peel, stem and chop just one of the tomatoes, and leave the rest of them whole (on the baking sheet). Pour the remaining tablespoon of oil into a wide, deep saute pan over medium heat. Add the onion, garlic and ginger; cook, stirring occasionally, until the onions are translucent and the vegetables are very soft, 8 to 10 minutes. Add the curry paste; cook, stirring, until fragrant and slightly darker in color, 2 minutes. Add the chopped tomato and coconut milk. Increase the heat to medium-high; once the mixture comes to a boil, reduce the heat as needed so the liquid is barely bubbling around the edges. Cover and cook for 15 minutes. Uncover, stir in the chickpeas, taste, and add more salt, as needed. Nestle the whole tomatoes in the pan. Cook, uncovered, just until the tomatoes have warmed through, 8 to 10 minutes. Remove from the heat. Scatter the cilantro over the top. Serve hot, with the optional accompaniments of your choice. Source: Adapted from New Feast: Modern Middle Eastern Vegetarian, by Greg and Lucy Malouf (Hardie Grant, 2017).